Football authorities in Cameroon have summoned the captain of their national football team, Samuel Eto’o (Anzhi Makhachkala) and his deputy Enoh Eyong Takang (Ajax Amsterdam), to a disciplinary hearing after the team refused to play a friendly, local media reported on Sunday. 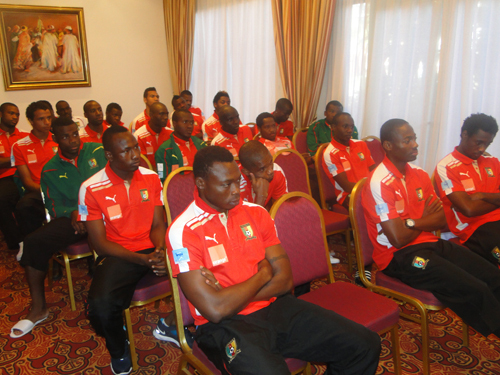 Cameroon were due to play Algeria on Tuesday 15 Nov but the players did not travel for the game. Cameroon authorities want Eto’o and Enoh to explain why the team basically went on strike, in what is seen by the Cameroon Football Federation (FECAFOOT) and the ministry of sport as gross misconduct and a disgrace to the country’s image. The players had issued a statement on 13 Nov saying they were not ready to play because of the non-payment of an appearance bonus (Prime de Presence) which they receive each time they are called to camp. By the time the sports ministry finally wired funds via a money transfer service less than 24 hours before kick-off, the players had firmly opted not to play and the game was cancelled. Officials want to punish the players but soccer pundits in the country have come to the team’s defence. “The problems the Lions have been facing are not due to the (in)competence of players or the coaches who succeed each other at a furious pace at the helm of this team,” wrote Cameroon Tribune, the government-run daily. “The issue of governance (administration of the Indomitable Lions) is a major concern,” the paper said. As an example of bad management, pundits point to the fact that the players only learnt in Morocco (where they were participating in a friendly tournament) that FECAFOOT was not expected to make any proceeds from the game in Algeria. In other words, they had not been told that they were practically going to play in Algeria for free and when they asked they were rebuffed by the officials present, journalists who travelled with the team said on a television show. It should be noted that FECAFOOT and the players have an arrangement wherein both parties split the proceeds of friendly matches. “If they asked what they were due and were not given an answer, it is quite normal, or rather, I think they felt it was quite normal, for their part , not to play this game,” Jean Paul Akono, the deputy national technical director, told CRTV. “These are professional footballers… If you do not tell them in advance that they are going to play a match without proceeds, which would surprise me, when they go to play, they expect to be paid… I doubt that there was no fee for this match against Algeria… “ added Akono, who is a former head coach of the Indomitable Lions. An interview given by the team captain to state radio (CRTV) on Friday 11 Nov, in which he complained about poor organisation and urged the authorities to take action, shows that the players had had enough of the unprofessionalism around them, pundits say. Fecafoot and the ministry of sport have in the days following the incident traded accusations over who was responsible for the unpaid allowances. The ministry says it only pays the (now infamous) “participation allowance” when the team is playing a competitive fixture, suggesting that the federation should be responsible in the case of friendlies. FECAFOOT issued a statement which suggests that these allowances are not mandatory but that they were willing to pay then once the team returned from Algeria. A federation spokesman said on local TV (Canal 2 International) that the federation did not have the funds in hand in Morocco. Both the federation and the ministry of sport have since held crisis meetings in which they resolved to dispatch a team of officials to Algeria to apologise for the failed rendez-vous. Meanwhile, media reports say the Algerian football authorities have taken the Cameroon football federation (FECAFOOT) to football’s governing body FIFA for breach of contract. The Algerians had sold out tickets for the match and sold broadcast right to several TV stations. They want FECAFOOT to reimburse the losses they have incurred. Benoit Assou-Ekotto has also been summoned to explain why he did not show up for the camp in Morocco.